A couple of weeks ago we had the chance to present at the AESP Digital Conference on customer engagement. It was a great day with some awesome presentations and presenters. KSV actually had the chance to present during two sessions, one on millennials (you can download our millennial brief here and hear more about millennials when we speak at the BECC conference in October). The second was about targeting large C&I customers with native advertising and we co-presented with our client, Erin Motta from National Grid. And boy, were there a lot of questions. At KSV, we've always known that targeting large C&I customers is a challenge, both from our experience inside the energy industry and from outside (we had a longstanding relationship with a global finance brand who needed to talk to this customer as well, you can see our case study here). So we thought we'd take this week's EnergyWire to answer some of the questions that we couldn't get to during the conference, and we also thought it might be helpful for you to get the perspective of Erin Motta. Erin, thanks for helping us with this! @ashKSV there were a lot of questions that we didn't get to answer during the conference, so we thought we'd explore a couple of the topics. One of the questions was about the strategy for choosing native as a vehicle for this audience. How did we arrive at it? How did you feel when we suggested this channel? Did you know what it was? @ErinM: We were excited. I hadn't done a native campaign before but I think it is where advertising is headed: more relevant, more personal, better content. I did know what native was, but I hadn't really considered it for a large C&I audience. And as for how we arrived at it, it was a part of a much bigger strategic plan. KSV and National Grid develop big, overarching strategic plans for the year based on our business goals. @ashKSV Right. It's important to note that there is no one thing that is a silver bullet, not a channel or a single message. @ErinM: Right. And for our large C&I efforts, our messaging is really tailored to our end-customer and what matters most to them. The KPIs for their business, and how those things intersect with what National Grid can offer. @ashKSV Another question was about how native works exactly, and I know that one of the things that surprised us was about where this message was getting served up successfully. @ErinM Yes. So this is where native is really different. Native is it's own channel, so instead of choosing media for your message to run on; you choose your audience that you want to speak to and the native publisher finds them online, sometimes in unexpected places, and delivers your message to them as content. So it's not really an ad, it's content that your audience will enjoy, sponsored by your brand. @ashKSV Which speaks to the fact that in order for native to work, it's got to be great content. @ErinM Exactly. We actually tested three different types of content; an article, an infographic and a video. All of them performed really well but it was the infographic that was a total slam dunk. @ashKSV Ok, and as a final question, what was the biggest thing you learned from this native campaign? @ErinM Well, we learned a lot. We learned that native as a channel requires a different approach to our brand standards, that just because you're speaking to large C&I customers doesn't mean that you have to rely on traditional channels or messages, that this audience, like every other, is hungry for great content that helps them solve business challenges. @ashKSV So we're exploring more native? @ErinM We're exploring more native. And more experiments. It's one of the things we really value about our relationship with KSV, that you guys understand our business so well and you have a test and learn approach, so we're constantly trying new things. @ashKSV We sure are. Thanks, Erin. Want to see the (award winning) campaign that KSV and National Grid did for large C&I audiences? 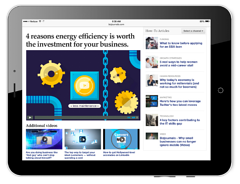 Want to learn more about native advertising or the targeting we did to reach this audience? Great news: we've got a brief just for you. 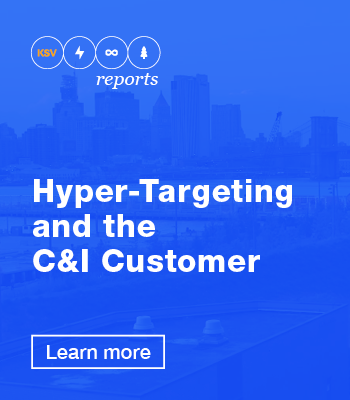 Check out our newest KSV Brief: Hyper-Targeting and the C&I Customer.